A prefix is a word part with a specific meaning at the beginning of a word. A suffix is a word part with a specific meaning at the end of a word. A root word is the main part of a word that contains its core meaning. Sometimes it is a word on its own, as in unbelievable (believe is the root word), and sometimes it cannot stand alone, as in relocation (loc is the root word). In either case, prefixes and suffixes can be added to root words, which might change either the meaning of the word (reactivate, deactivate) or its grammatical function (transports = present tense, transported = past tense, transportation = noun). Sometimes spelling changes when suffixes are added to root words (noise, noisy). A word that is formed using a prefix, suffix, or root is referred to as a derivative, which means that word was derived from or includes the word part. figure out what a word means. spell words by identifying patterns. Identify your root and its definition. 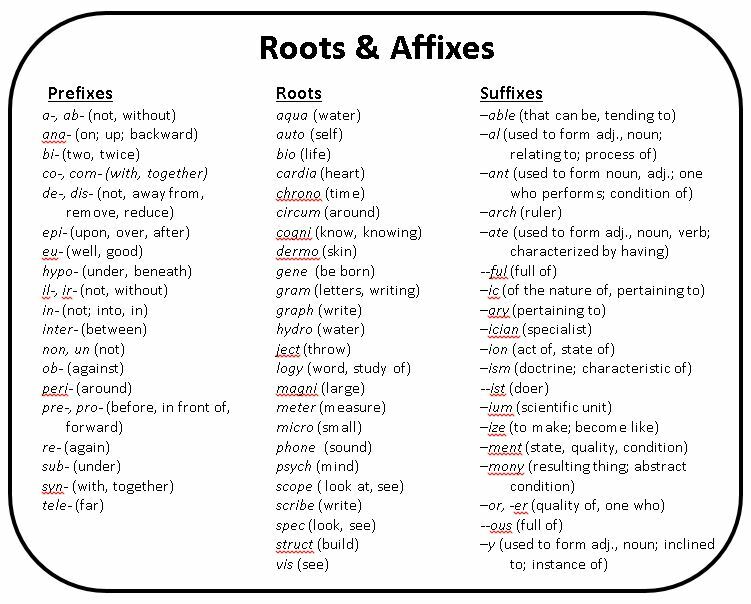 Complete a word tree or other type of visual representation for your prefix/root/suffix. For each root word page, list two derivatives and create a word map for each. Add an image or sketch that reflects the meaning of the word. Write a descriptive sentence for each word, giving context clues about the meaning of the word. Underline each derivative. Include a title page and table of contents.